The Supreme Eiye Confraternity aka HABA KRIER is an indigenous students cult founded at the University College Ibadan in the year 1964/65. It was formed by the following students: Goke Adeniji, Dele Nwakpele, Bayo Adenubi, Bode Fadase, Tunde Aluko, Kayode Oke, and Bode Sowunmi among others. It was name Eiye group and later metamorphosed into Supreme Eiye Confraternity (SEC) It is assumed that the inability of certain students not to meet the initiation standards of the Pyrates confraternity otherwise known as the National Association of Seadogs led to the formation of the Eiye Confraternity and other groups on campus today. It is also imperative for me to state that the battle of supremacy amongst these confraternities at our various institutions of higher learning today did not just start as their founding fathers did engaged in fistfights even if they weren't as violent as it is today. According to Wikipedia, The Neo-Black Movement of Africa (also called Black Axe) emerged from the University of Benin in Edo State. In 1983 students at the University of Calabar in Cross River State founded the Eternal Fraternal Order of the Legion Consortium (the Klan Konfraternity), the Supreme Vikings Confraternity (the Adventurers) the following year. It is also worthy to note that most University VC's used these cult groups to discipline or fight against student union leaders during the military regime. 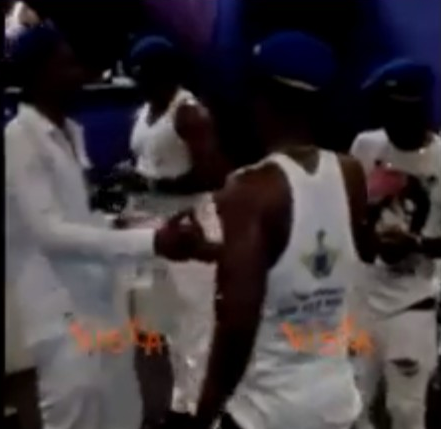 The Supreme Eiye Confraternity and similar cult groups further emanated from campuses to the streets in the early 1990's which truly is the cause of most cult clash and supremacy battle leading to blood baths especially in the towns of Benin, Ughelli, Awka, Yenagoa, Port Harcourt, Owerri, Enugu, Ikorodu, Bida etc. It is also worthy to note that the fiercest rival of the Eiye confraternity when it comes to cult wars is the Blackaxe confraternity. If you are very conversant with this blog you must have seen stories where the Blackaxe cult members were alleged to have killed over 22 members of the Eiye cult group in benin just in one night. Not even the Amnesty granted these cult members have been able to quell the various rivalry that has killed not less than 20,000 members of various groups since the early 1980's. Memebrs of the supreme Eiye confraternity are popular called Tin Golds especially by rival frat groups on campuses, the group was initially found to promote african msuical culture as this is still evident in their practices today. The Eiye cult members call their songs "Jor Jor". The symbol of the Eiye Confraternity is an eagle and they name their Exscos according to birds. The leader of the cult group is called the "Ibaka" his second in command is called the "Ostrich". The colour of the Eiye fraternity is blue, their dress code is always Black pants, White T-shirt, and Yellow hose. The Eiye confraternity is good at forcing or cajoling new students on campus to join their group. Their initiation process involves series of severe slaps, beatings and flogs on the applicant to test his patience and commitment. The applicant is further subjected eating of raw grains like rice, beans and garri. Memebrs of the Eiye fraternity refer to a particular school where initiates are recruited as "Nest" meaning the home of birds. One of the most popular Nest the Eiye fraternity boast of is the "Afara Nest"
Remember! Cultism is a serious menace that has taken the lives of thousands and has robbed them of their bright future and destinies. SAY NO TO CULTISM!